My Sweet Haven: His first snow. Living here in Montana wouldn't be complete if you don't have snow pictures, lol! So finally we succumbed to having Caleb have his first snow experience right in our own backyard. He had a blast! Hubby was going to make some snow balls but it was too powdery and dry, so we're gonna have to save the snow man experience until next time. 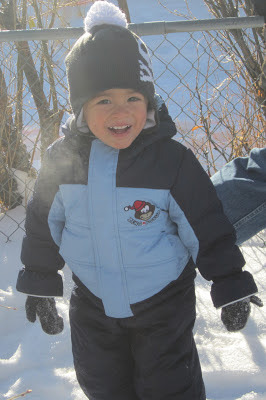 Despite being cold and bundled up that he can barely walk, lol, I thought he loves playing in the snow. We didn't have him out there for very long though because we were afraid of him getting sick but the pictures said it all. He enjoyed his first snow encounter.